The Voluntary Honey Bee Best Management Practices (BMP) Policy has been developed by the Tennessee Department of Agriculture’s Apiary Technical Advisory Committee at the request of the Tennessee Municipal League and the Tennessee beekeepers to provide guidelines for beekeepers maintaining honey bees in urban areas. When followed these BMP’s help ensure that beekeepers are keeping their managed colonies of European Honey bees in a safe and responsible manner. European Honey bees are generally gentle in nature. Honey bees are an important component of both rural and urban ecosystems. They are an important pollinator for native and cultivated plants. Honey bees play a crucial role in the production of food for humans, livestock and wildlife. Managed colonies can be safely kept in all areas of the State. Currently, there are managed colonies of European Honey bees in the downtown areas of all major Tennessee cities that are being kept without any stinging incidents or other problems. When properly managed, most neighbors do not even realize they are there. 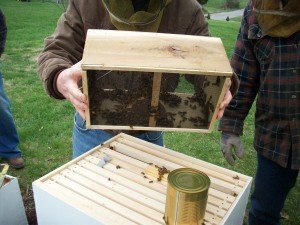 Tennessee beekeepers provide an important service to the public by providing pollinators, honey, capturing feral swarms and removing feral colonies of honey bees from structures in both rural and urban areas of the State. Click here to download the complete document as a PDF file.